I love this series, so I love it when Kate visits! 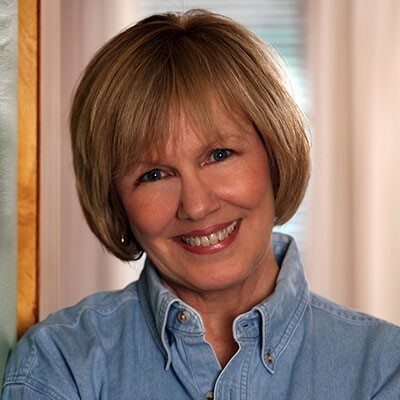 Kate Carlisle is the New York Times bestselling author of the Fixer-Upper Mysteries, featuring Shannon Hammer, a home contractor who discovers not only skeletons in her neighbors’ closets, but murder victims, too. Hallmark Movies & Mysteries is bringing the Fixer-Upper Mysteries to TV in a series of movies starring Jewel and Colin Ferguson. Visit Kate online at www.KateCarlisle.com. Everyone in the homebuilding industry has run into a snob a time or two, I’m sure. My dad would bring home stories that made all of us roll our eyes. Like the gold-plated toilet handle. In my latest Fixer-Upper Mystery, Eaves of Destruction , contractor Shannon Hammer has been hired by rival neighbors to beautify their homes for the hotly contested title of Best of Show in the annual Victorian Home and Garden Tour. One client is outraged when Shannon suggests they buy wood onlays to replace carved panels. I covertly rolled my eyes as I said the words. As if something coming from England made it more legitimate? But for some people, that fact made all the difference. To show you just how foolish Petsy’s snobbery is, here’s an example of a beautiful onlay from ArchitecturalDepot.com. Many onlays are carved from wood—real wood—so there’s nothing fake about them. They’re simply made. . . elsewhere. And, by the way, as Shannon points out in the book, people in Victorian times used onlays all the time! That got me thinking—when else is “fake” okay? Honestly, I’ve been blond so long that at this point, my natural color would feel fake. Who is that strange woman? The advances in prosthetics have been jaw-dropping. It’s so heartening that loss of a leg—or even both legs—no longer means a person is facing a life of severely limited mobility. It’s still not something anyone would choose, but wow, what a difference prosthetics have made! Can you think of any other examples of when “fake” is okay? Thank you so much for visiting today Kate! Murder is on the to-do list when construction contractor Shannon Hammer looks for a killer in the fifth Fixer-Upper Mystery…. Shannon is in high demand among rival homeowners, who will do anything to win Best in Show. One-upmanship and even espionage break out among neighbors, construction crews, decorators, and landscapers. Thanks to several new hires, Shannon is sure she can handle the extra load—until murder throws a wrench in the works. The small town’s corrupt building inspector is found dead on one of Shannon’s jobsites, and soon plenty of suspects are coming out of the woodwork. When another body is discovered, Shannon calls on her team of close friends and devilishly astute thriller writer Mac to help her nail down the details and build a case against the killer before the door shuts on someone else—for good. Lighthouse Cove is getting ready for the Victorian Home and Garden Tour and everyone wants to have a little work done in hopes of coming in 1st this year. No one wants to win more than Petsy Jorgensen. Her neighbor won last year so she is pulling out all the stops with some delicate work inside the house and adding an orangery onto the house as well. Petsy is a “difficult” client but Shannon feels the home is a real “gem” and she really wants this job. She has several works in progress so he has hired a new carpenter to help with all the work the Home and Garden tour is bringing to her company, especially the detailed work for the Jorgensens. Work at all the sites is on schedule until the town’s building inspector is found dead at one of them. Joe Scully has been a thorn in Shannon’s side since she took over the construction business from her dad. He seemed to rub everyone in town the wrong way so building a case isn’t going to be easy. At least the police don’t think Shannon is a suspect. Still she teams up with her favorite thriller author Mac to see if together they can hammer out the details and close the case before more bodies start piling up on her jobsites. This was a story with many, many layers, taking us on quite a historic tour of our own. The Jorgensen house has been in the family forever so it is easy to understand why the current caretakers would want it to be a showplace. But Petsy Jorgensen is all about winning the prize. 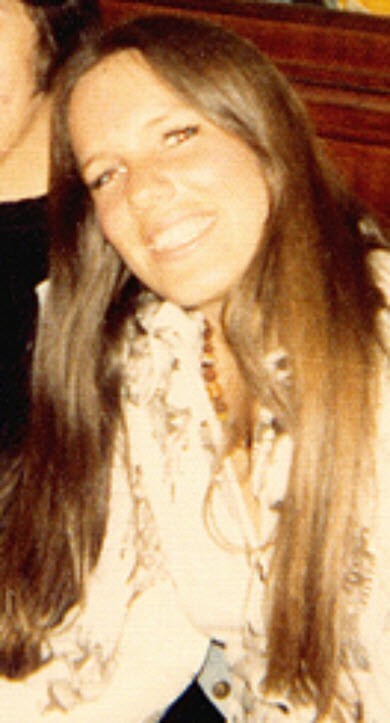 She was a mean woman and hard not only on Shannon and her crew but to her family as well. Shannon didn’t like it but took it and kept her mouth shut for the most part. The author has given Shannon much more patience and focus than I would ever have. That being said this evil character is so well written and fleshed out, as are her husband and daughter. I got very emotional over the way Petsy talked to and treated her daughter. I worked in construction for awhile so following Shannon around is extra fun for me. Her take on onlays and the work her carpenter did in the Jorgensen’s dining room was very interesting. For me, the building inspector was the perfect victim. Good ones are picky but corrupt ones like Joe Scully have no place in the building world, but sadly there are quite a few out there. While not a good idea in real life, having one killed in a fictional sense was pretty delightful. All my favorite characters from previous book have returned and I love the way Shannon’s dad and her uncle are celebrating their retirement. Shannon and Mac’s relationship is strong and their dialogues are very real. The do make a great sleuth team. Shannon’s interactions with her crew are also very true to life. As always the setting is divine, I love Victorian houses and all their little nooks and crannies and bonus spaces. I really enjoyed the mystery. It was pretty fast paced with some very clever twists. It was very well thought out and with a fantastic ending. I highly recommend the whole series! Thanks to the publisher I have 2 copies to give away. I love the tv show these books are based on. Thank you, Melody! 🙂 It’s the other way around… the Hallmark Movies & Mysteries shows are based on my books. (The HGTV show is not related to my series, if that’s what you meant.) I hope you’ll give my books a try. 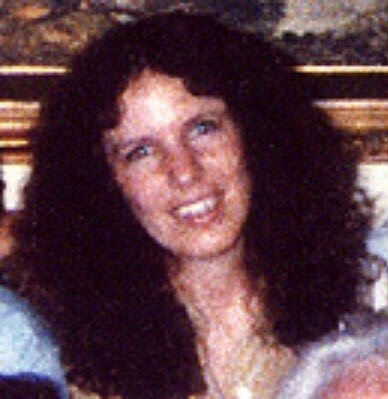 You can read chapter 1 of each book for free on my website, KateCarlisle.com. Great series, both in books and on TV. Thank you, Dianne! I’m so glad you’re enjoying the Fixer-Upper Mysteries. Fake would be OK if it was a vegan substitute like vegan “cheese” for someone who couldn’t have dairy. Yes! That’s an excellent example of when fake is okay. 🙂 Thanks for playing, Sandy. YES! When a person is dealing with cancer, anything that makes her feel better is okay in my book. Thanks for your nice comment, Celia. I’m so glad you’re enjoying the Fixer-Upper Mysteries in print and onscreen. 😀 Jewel and Colin Ferguson do a wonderful job of bringing my characters to life. I love them both! Your example of a wooden onlay is beautiful. Isn’t that pretty? ArchitecturalDepot.com has a lot of beautiful onlays, and really affordable. I love this author and this series!! So great! Thank you for giving this one away as it is one that I had on my to buy list she is such a good author! Wonderful feature and giveaway. This series is a gem. Hi Kate, We don’t have cable so we have to make do with reading your books. I’d love to be the lucky winner and place it next to your other titles on the shelf of my growing library (2100 and growing). I’d have more if we hit the lottery for enough to build a home with an actual library wing attached to it. Right now we get by with one full wall in two spare bedrooms. The shelves are double stacked plus books lying sideways on top of the stacks. I have been blessed by the cover gods! This cover made me squeal a little when I first saw it. In part because I was really happy that Robbie the Westie is there, and in part because I just love that the orangery from the story is featured. I love this series! I can’t wait to read this one plus I’m giving the whole series to a friend for her birthday and I’m bursting to finally give it to her! What a great gift idea–hours of entertainment! 🙂 I hope your friend loves my books as much as you do, Amanda. <3 Thank you for sharing the love. I can’t think of a lot of fake things right now…other than the false fronts people put on for themselves and others. Great series! 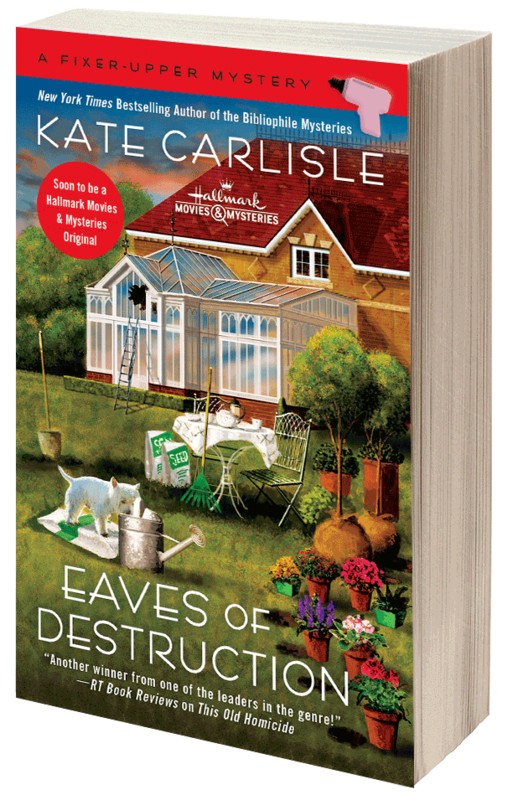 I’m really looking forward to reading “Eaves of Destruction”. Yay! I’m so glad. 🙂 Thank you, Dianne. Hope you’ll enjoy the mystery. Great write-up… I’m looking forward to reading it! Thank you, Kelly! I hope you’ll love EAVES OF DESTRUCTION. You can get a sneak peek at Chapter 1 on my website, KateCarlisle.com. One of my favorite series – both the books and Hallmark! Oh, that’s so good to hear! Thank you, Karen. I appreciate it. Thank you for the giveaway! This is one of my favorite series and I can’t wait to read it! I can’t quite picture how an inlay would replace something carved, but I’m sure that’s unimportant when murder is afoot! I have to agree with the prosthetics, it’s amazing what they do now. Reproductions of furniture, since I can’t afford the real thing, fake nails are okay, wigs, anything that will make you feel better about yourself. I love all the details about building/repairing Victorian homes that Kate includes in these books.